All cycle trainers use a metal frame to hold the bike upright and lift its rear wheel off the ground. The rear tire then rests against a metal roller, allowing the bike to remain stationary while pedaling. The difference in trainers comes from the way they produce resistance. We carry different models from CycleOps. Wind trainers use a fan to produce resistance. As the rear wheel spins the roller, the roller spins a fan, which produces pedaling resistance as it pushes against the air. 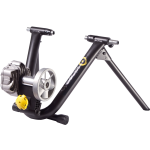 The benefits of this design include low cost, natural progressive resistance (as you pedal faster, the resistance naturally increases), and no chance of overheating. The drawbacks are that the fan can tend to be noisy. Magnetic trainers use magnets to produce resistance. The tire spins the roller, which spins a flywheel. A magnet produces resistance against the metal flywheel. Most magnetic trainers, use a manual dial to move the magnet closer or further from the flywheel, thus increasing or decreasing the resistance. Benefits of magnetic trainers include reasonable price, quiet operation, and in the case of the Magneto, progressive resistance. 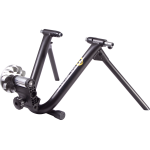 Drawbacks include lack of progressive resistance on most models, requiring that you get off the bike and manually adjust the resistance level. However, there are models, such as the Mag+ (see image below), that feature a mechanical remote controller that mounts to the handlebar to adjust the resistance while on the bike. 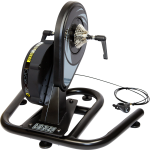 Fluid trainers use a combination of a weighted flywheel and a fluid-encased fan to produce the quietest, most realistic-feeling resistance of all trainers. Like the wind trainers, fluid trainers use a fan to produce a realistic feeling natural progressive resistance. However the fluid trainer’s fan is encased in a self-cooling, fluid-filled unit that allows it to spin silently. Benefits of this design are quiet, smooth, and realistic-feeling progressive pedaling resistance. The primary drawback of this unit is higher price. Rollers are a different sort of training device. Unlike the typical cycle trainer, rollers do not hold the bicycle upright. Instead, they consist of a series of three large rollers in a metal frame. The rear wheel of the bike rests on the back two rollers, while the front wheel sits on the single front roller. A belt connects the front and rear rollers. As you pedal, the back wheel spins the back rollers, which spins the front roller via the belt, which spins the front wheel of the bicycle. The gyroscope effect of the spinning wheels helps the cyclist stay upright. Rollers have several advantages over trainers, the most important being that they can improve bike-handling skills as well as keeping the cyclist in shape. This main advantage can also be a big drawback, as rollers can take some time to master. They are also very quiet and give a more realistic-feeling ride than any trainer, although they take up much more floor space. Visit www.CycleOps.com for more info about Indoor Trainers.